The white brick contemporary house at 153 Proprietors Crossing was inspired by New Canaans legacy of mid-century moderns. 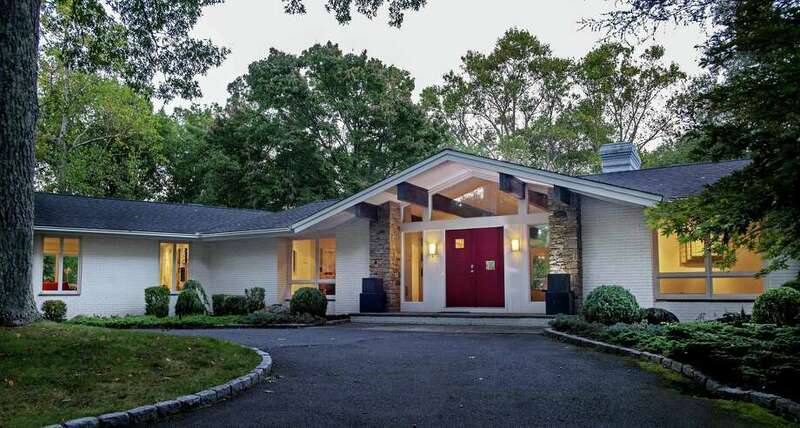 NEW CANAAN — New Canaan’s streets contain classic colonials juxtaposed with mid-century modern houses; a successful pairing of two disparate styles. The Harvard Five - John M. Johansen, Marcel Breuer, Landis Gores, Philip Johnson (of the Glass House fame), and Eliot Noyes, are credited with the introduction about 100 mid-century modern masterpieces to the town’s architectural landscape, and their influence continues even today. The white brick contemporary house at 153 Proprietors Crossing was originally built in 1971. The current owner, a professional interior designer, gutted the house in 2003 and re-imagined it. The rebuild project created a 12-room mid-century modern-inspired house with walls of glass that provide incredible light and dramatic property views. It also created a great living and entertaining space inside and out including a custom Wagner in-ground, over-sized swimming pool with automatic cover and an outdoor kitchen with a wine refrigerator, food refrigerator, shelving, stove, oven, and sink. The owner kept the original footprint of the house because it comprised a great layout, but essentially built an entirely new house with new plumbing, electrical system, sheetrock, and lighting. All the cabinetry throughout was custom-made specifically for this house and was imported from Italy, the owner said. The house is set on a four-acre level and sloping property at the end of a quiet cul-de-sac in the town’s west side. The setting offers privacy and yet it is only one mile from Scott’s Corner in neighboring Pound Ridge, New York and its stores and restaurants, and it is only eight minutes from the center of New Canaan, which includes the Metro North train station. So private is this setting that even in winter when trees are bare of leaves neighboring homes are not visible. A circular driveway leads up to the 6,000-square-foot house, which sits on a hill. A wide bluestone apron serves as a welcome mat of the covered front entrance, where French doors open to reveal a spacious sunken living room with a floor-to-ceiling wood-burning fieldstone fireplace, cathedral ceiling, and a wall of windows. In the formal dining room there are sliding doors to the sizeable wood deck. As with the rest of this house natural light is the hallmark of the spacious modern kitchen. Its features include the custom Poliform Italian cabinets, a two-tiered center island with a breakfast bar and five-burner Wolf range top, Wolf wall ovens, and a skylight. In the eat-in portion of this gourmet kitchen there are sliding doors to the long deck. Off the kitchen there is the family room which, like the living room, has a wood-burning fieldstone fireplace. At the opposite end of this main floor the master bedroom suite features sliding doors to a private balcony with circular stairs to the lower deck and yard. The master bath features a water closet with a privacy frosted glass door, an eye-catching double vanity with a decorative mosaic tile backsplash, a sizable shower, and a large dressing room and walk-in closet. A separate “children’s” wing contains three more bedrooms and a shared hall bath with two side-by-side pedestal sinks, combination tub/shower, and an electric blue mosaic tile floor. On the full, finished lower level there is a long corridor with wall-to-wall carpeting that provides access to several rooms and the three-car attached garage. Flanking the entrance into the great room there are ledges that are covered in blue and black mosaic tiles. The room itself has a fireplace and sliding doors to the lower level wood deck. The fifth bedroom is also on this level and it has a private bath making it a perfect guest or au pair suite. There is a large exercise room with a sliding door to the yard. The good-size laundry room has counter space and a sink. Ample storage is available on this level and elsewhere. For more information or to make an appointment to see the house contact Hannelore Kaplan of Hannelore & Company/William Raveis Real Estate at 914-450-3880 or Hannelore.Kaplan@raveis.com.